The Bulls finished the NBA preseason the only undefeated team, leading everyone in point differential and one of two teams yielding fewer than 90 points per game. The Bulls were leading in field goal defense and in the top three in rebounding. Of course, the statistics don’t count. But they suggest a Bulls team as prepared as any for the season. But are they too prepared? That has long been the biggest question raised about Bulls coach Tom Thibodeau and the vagaries of the last three seasons, most of which have been interrupted by injuries and playoff disappointments. But Thibodeau, who is regarded as one of the top five coaches in the NBA, remains committed to his philosophy. And you’ll not get objections from his players. They appear anxious for this season and seem to want to enjoy as much of it as possible. By playing. Deng’s point is it’s a matter of opinion. But the best record, which may mean pushing yourself a bit more, does matter in the playoffs. If the Spurs were playing the final two games back in San Antonio instead would they be champions? Would Miami have even gotten there if they didn’t have Game 7 at home in the Eastern Conference finals? Some questioned the way the Heat pushed themselves during their 27-game winning streak last season compared with, say, the Spurs who regularly rested their best players and finished with the second best record in the West. But if Russell Westbrook were not injured in a freak play, would the Spurs even have gotten there playing their conference finals on the road? Deng perhaps more than any other Bulls player should be more concerned about playing time given he’s led the league in average minutes per game the last two seasons. But Deng does his own Ernie Banks of let’s play 40. Of course, if you’re hurt, don’t play. But don’t be too cautious. And Thibodeau, who has grown somewhat sensitive about his rotations given being asked about it in so many ways the last few years, made it clear before the Denver game that what you’ve seen is what you’ll get. “You’re building wining habits all season long,” said Thibodeau. “(If) you try to establish your habits when you get to the playoffs, it’s too late at that point. The challenge is to be playing your best at the end. That is going to be necessary to be successful in the playoffs. “Talk to guys like Jordan, Paul Pierce, (Tim) Duncan early in his career. 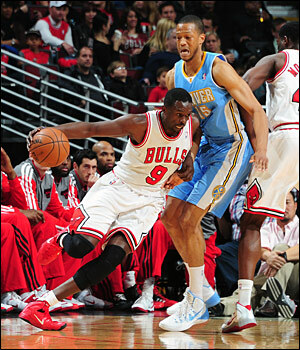 Those guys conditioned themselves to play big minutes,” Thibodeau noted. “Pippen played big minutes here. You start pacing yourself, you get yourself in trouble. Unfortunately, not all the Bulls best players have been on the floor with Joakim Noah playing just under 20 minutes in just one preseason game with a groin issue. Also, Kirk Hinrich sat out the last three games after a concussion and a shoulder problem. Hinrich seems more likely than Noah for Game 1 in Miami Tuesday. But no one has been ruled out with practices Sunday and Monday and Noah anxious to play. So the Bulls need to work Noah back in, though he has practiced on and off in the preseason. And Thibodeau has his philosophy and the Bulls players are ready. It’s go time. Throttle all the way out.